Members of the women-led community in Bishupur, Nepal. Photo credit: David Gritten. The Asia-Pacific region has some of the highest absolute numbers of people dependent on forests for significant portions of their livelihoods, and also stands to suffer some of the greatest expected economic and loss of human life as a result of adverse climate change impacts. In numerous sites across the region, community forestry (CF) has proven to be an effective approach both for reducing forest loss and degradation and for sustainably managing forests for multiple benefits. Community forestry (CF) can be a powerful approach for improving rights, governance and fairer access to benefits for local communities and smallholders; all of which supports the adaptive capacity of communities and the resilience of ecosystems on which they rely. There is increasing policy support for this approach across the region and growing interest in how CF can simultaneously support climate change mitigation and adaptation goals. This report* presents a framework developed by RECOFTC and USAID Adapt Asia-Pacific for better understanding and assessing climate change vulnerabilities in a context of multiple competing interests in a CF landscape. It establishes a framework, approach and tools to assess climate change vulnerability in a CF landscape context, and provides the fundamental assessment for identifying the adaptation interventions to be undertaken in the course of the project. 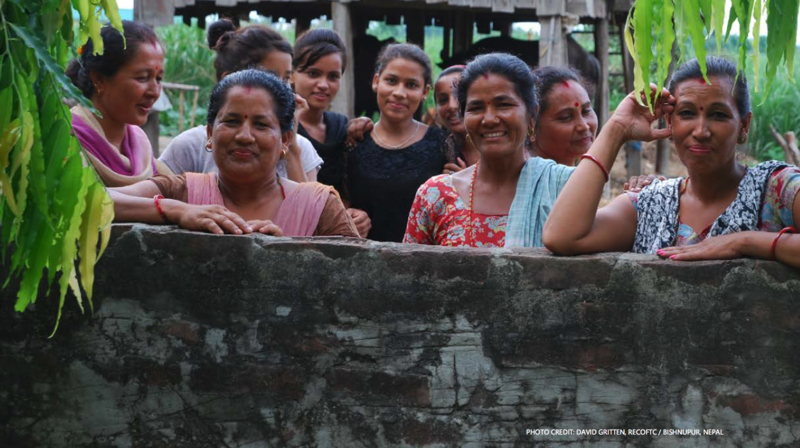 The pilot site for developing this approach was a women-led Community Forestry User Group (CFUG) in the Terai of Nepal; the Bishnupur community forest. The context in Bishnupur reflects challenges associated with the ecologically fragile Chure Forest, but also one of growing opportunities for economic development due to the close proximity of the Indian border. The community has served as a valuable, and generous, testing ground for the approach and a continuing pilot site for the implementation of interventions identified through this Vulnerability Assessment process. *Download the full report form the right-hand column. An overview of the approach and the identified adaptation options are provided below. The vulnerability assessment (VA) framework comprises three major phases: I) assessment; II) intervention feasibility assessment; and III) implementation and monitoring of selected adaptation interventions (figure 1, below). This report presents the findings of phase I of the framework through the lens of sustainable livelihood assets organized according to sector. There are two main components to the methodology: data collection and data analysis. A number of tools have been developed to support both aspects. Primary data was collected by drawing upon VA methodology tools of other approaches and general participatory rural appraisal (PRA) and participatory action research (PAR) tools (see below). Table 1 on page 13 of the report provides a list of the various tools employed in the VA data collection and analysis process. With trained and experienced staff, a similar process using the VA tools could be done in two months or less. The vulnerability assessment identified a selection of possible adaptation options. The options are linked specifically to the vulnerabilities identified, as opposed to a specific climate change threat or sector, as many of these potential responses cross-cut sectors and respond to vulnerabilities which result from a combination of climate (and non-climate) threats, which would be both difficult and unnecessary to disaggregate. Declining productivity of agricultural crops due to decreasing quality of soil, changing rainfall patterns, increased pests and weeds. Decreasing income from sugarcane due to loss of productivity as well as capped prices imposed by the sugar mill. Reliance on a single monocrop (sugarcane) leaves the community without alternative sources of income. Decreasing availability of useful multipurpose tree species within the community forest. Increasing workload of women by 1-2 hours daily as a result of decreased nearby household water sources. No water available for home gardens or for diversifying agricultural-based sources of livelihood. Village and district are relatively low lying and prone to flood, which has the potential to destroy bridges and prevent road access with multiple secondary implications. Agro-forestry systems: In order to support both ecosystem and livelihood resilience, one adaptation response area identified is in the strengthening of agro-forestry systems. The purpose would be to diversify cropping and land-use systems in order to meet multiple objectives such as reduced dependence on a single crop, increased overall forest cover for ecosystem services, and increased multi-functionality including trees for livestock fodder and income generation (e.g. bamboo, honey, medicinal or essential oils). Response to water shortage: Despite evidence and forecasting of increased rainfall, a water shortage is perceived by the community to be one of their most prominent vulnerabilities. Tackling this problem requires an eye towards a short-term solution with long-term sustainability. It will likely involve a ‘suite’ of options possibly intersecting with agroforestry systems in that it would incorporate water conservation-oriented landscape management. This package of activities may include well drilling, retention pond construction, agricultural practices to conserve water and discussions at district and watershed level of management strategies for the ground water table. Riverbank stabilization: River flooding has been an ongoing challenge in Bishnupur community, so much so that it was the flooding that originally instigated the planting of the community forest as a protection measure. With a forecasted increased likelihood of more intense rainfall, there is a need to stabilize the riverbanks in and around the community in order to minimize soil and land erosion, maintain the integrity of the community forest and reduce the impacts of flash flooding. This report was prepared on behalf of USAID Adapt Asia-Pacific by Regan Suzuki Pairojmahakij, Senior Program Officer, RECOFTC – The Center for People and Forests and Chhote Lal Chowdhary, project consultant. USAID Adapt Asia-Pacific and The Center for People and Forests (2017) Developing a Demonstration Site in Nepal on Community Forestry, Gender and Climate Change Adaptation. USAID Regional Development Mission for Asia: Bangkok, Thailand.